University of Arizona Press, 9780816500550, 232pp. The award-winning American environmental writer Barry Lopez has traveled extensively in remote and populated parts of the world. Lopez’s fiction and nonfiction focus on the relationship between the physical landscape and human culture, posing abiding questions about ethics, intimacy, and place. Other Country presents a full-scale treatment of Lopez’s work. James Perrin Warren examines the relationship between Lopez’s writing and the work of several contemporary artists, composers, and musicians, whose works range from landscape photography, painting, and graphic arts to earth art, ceramics, and avant-garde music. The author demonstrates Lopez’s role in creating this community of artists who have led cultural change, and shows that Lopez’s writing—and his engagement with the natural world—creates an “other country” by redefining boundaries, rediscovering a place, and renewing our perceptions of landscapes. Warren’s critique examines manuscripts and typescripts from the 1960s to the present, interviews with Lopez conducted from 2008 to 2013, and interviews with artists. Part 1 focuses on the relationship between Lopez’s storytelling, which he calls “a conversation with the land,” and Robert Adams’s landscape photography. For both Lopez and Adams, a worthy artistic expression serves the cultural memory of a community, reminding us how to behave properly toward other people and the land. Part 2 looks at the collaborative friendship of Lopez and visual artist Alan Magee, tracking the development of Lopez’s short stories through a consideration of Magee’s career. Part 3 moves farther afield, discussing Lopez’s relationship to Richard Long’s earth art, Richard Rowland’s ceramics, and John Luther Adams’s soundscapes. 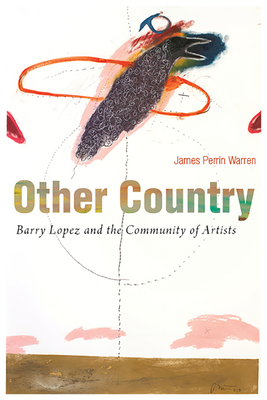 Other Country reveals the dynamic relationships between Lopez, considered by many the most important environmental writer working in America, and the artistic community, who seek to explore the spiritual and ethical dimensions of an honorable and attentive relationship to the land and thus offer profound implications for the future of the planet. James Perrin Warren is S. Blount Mason Jr. Professor of English at Washington and Lee University. He is the author of several books, including The Road to the Spring: Collected Poems of Mary Austin.